FastTest can deliver tests either via traditional paper-and-pencil or online via a secured web browser. Paper-and-pencil testing involves simply printing the test after it has been finalized. To deliver tests online, you must create test sessions, upload examinee lists, purchase test credits, and then email test codes to examinees or proctors. When a test has been assembled, it can be printed for paper-based test delivery. 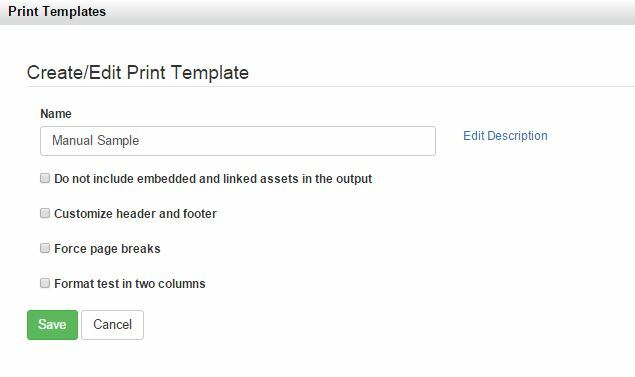 On the Test Assembler tab, click Print → Download For Printing or right-click and select Download Test. You will be presented the choice of format: New PDF (beta), PDF, Doc, and HTML (Figure 7.1). If not PDF, you can then edit formatting before printing. 1. Log in and go to the Test Assembler tab, which manages all test forms. 2. Right click on the form you want, and choose Download Test. 3. Select Doc (Microsoft Word) format and Download. It will come in as fullscreen view; use the View tab in Word to change to Print Layout view, where it displays as if on paper pages. 4. Remove the html tables. A great VBA macro for that is shown below. Hit Alt+F11 to bring up the macro screen, paste this in the code box, and hit the green Run button. Note: If you save this in the Atl-F11 screen, it should stay there forever, for future use. 5. Edit as you need; page breaks or anything else you want to do before printing. You have the option of uploading the test back into FastTest after editing. An important note: the images in these files are linked images. When you first export, they only reference the original image file on the secure FastTest server. If you do not have an Internet connection when you open the document, the images will not show. However, Microsoft Word has a way to embed these images, so that they are permanently independent of FastTest. Note that this option will only appear if there actually are linked files in the document. A dialog will appear showing each linked image. The user can select all of these links and check “Save picture in document” under “Options for selected link,” then click OK. The images will then be part of the Word file itself, which will substantially increase the file size. Unfortunately, there is no similar “Prepare → Edit Links to Files” in Word 2003, but there is a keyboard shortcut. In Word 2003, the user can select each image and press CTRL + SHIFT + F9 to embed the image. To save time, the user can also CTRL + A to select the entire document and then press CTRL + SHIFT + F9. FastTest offers some control over the document that will be saved for printing. 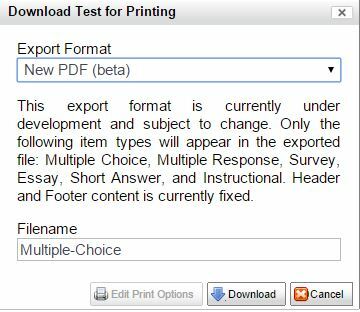 To configure the available options, click Print → Edit Print Options (with the test selected) or right-click the test and select Edit Print Options. The dialog shown in Figure 7.2 will appear. 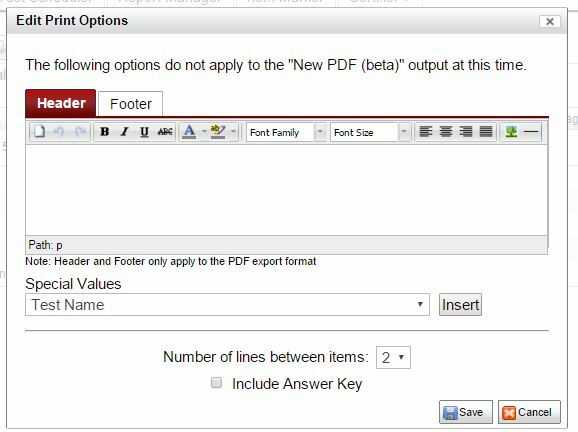 For PDF outputs, header and footer texts can be entered. These texts will appear at the top and bottom of every page (respectively) and can contain special values for, e.g., current page number and test name. The number of blank lines between each item can be specified via a drop down menu. 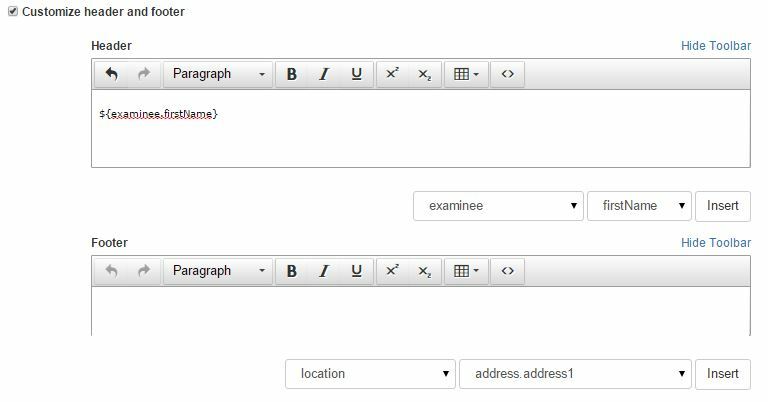 The test’s answer key can optionally be included as the last page in the document via a checkbox. Once you have downloaded the test file, you may want to make further modifications to it. For example, you may want to add a header and footer or adjust the spacing of an item. FastTest enables you to upload a test file that was modified in order to keep it accessible to your workspace. Figure 7.3 shows the dialog for uploading. You can access it by selecting your test and clicking Print → Manage Edited Versions or right-click the test and choose Manage Edited Versions. A test file stored here can be downloaded by anyone with access to the test. Examinees tested via paper-and-pencil can have their responses uploaded into FastTest to be scored. Each examinee whose responses are uploaded in this way to be scored and stored requires one-half of a test credit.